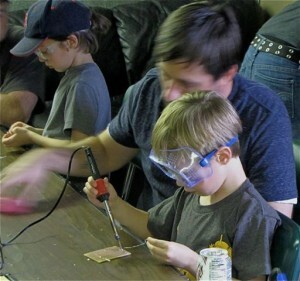 RVA Maker Guild had our first lab last Sunday, 11/17, at hack.rva. We worked on learning to solder and it was a great success! We had 7 kid members and 11 mentors, which is a wonderful ratio. Thanks to hack.rva for the use of the space and to the members who turned out, sans kids, to help mentor, and thank you to everyone for coming out. The goal of the session was to introduce soldering, to practice a bit, and then to make something that works. We started by tinning the tips of the soldering irons and melting some solder, then twisted two wires together to practice applying the solder. Next, we soldered some resistors to prototype boards so everyone could practice soldering to a surface. The prototype boards were great since you can also practice soldering on the pads, just to get the feel of how to apply heat to the pads before applying the solder, then you can build on that and add a component. 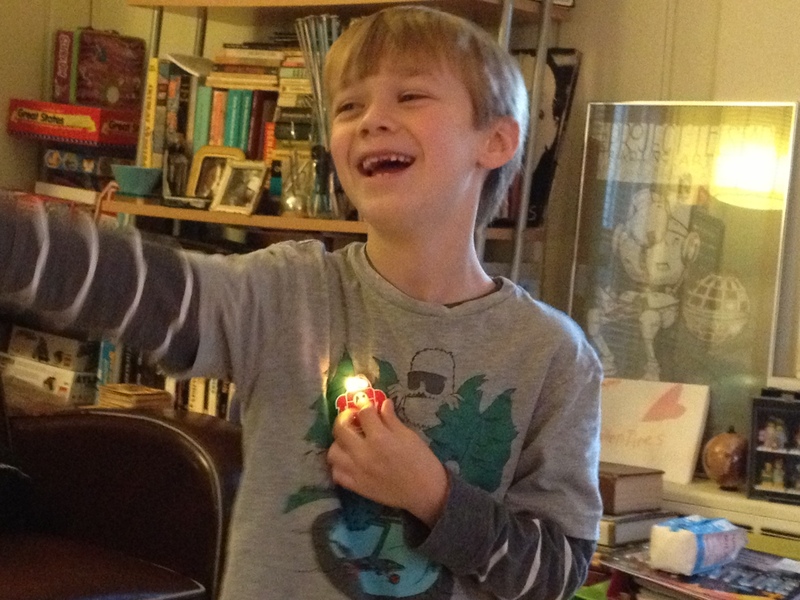 Finally, we made light-up robot badges, using a kit from the Maker Shed that proved simple, yet satisfying. All the kids completed their badges (they all were blinking away) and everyone seemed proud of their work. Everyone went home wearing their blinky badges and with the awesome Adafruit book E Is For Electronics, illustrated by RVA’s own Rob Ullman. You know it was a success when they’re still wearing it the next day. I hear one badge even went to school!